President Trump recently vowed to "do a big number" on Dodd-Frank. 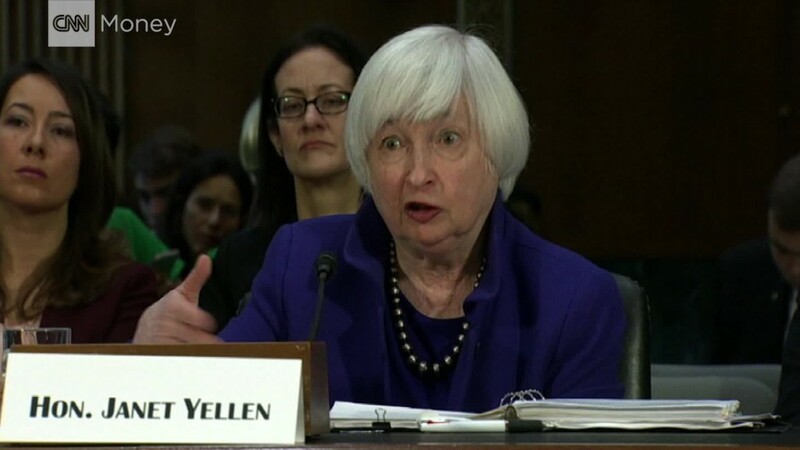 Janet Yellen doesn't believe that should happen. Point by point, the Federal Reserve chief on Tuesday debunked the core arguments used by the White House to push for rolling back the 2010 Wall Street reform law. Trump has bashed Dodd-Frank as a "disaster" that has choked off bank loans. The president even said "many friends of mine who have nice businesses" can't get loans due to strangling regulations. Asked during Tuesday's U.S. Senate hearing if there's any truth to claims that banks aren't lending, Yellen said an "extremely low number" of small businesses complained of access to credit as their main problem. The Fed chief quickly rattled off numbers from a National Federation of Independent Businesses survey showing that just 4% of respondents are unable to get the loans they need. 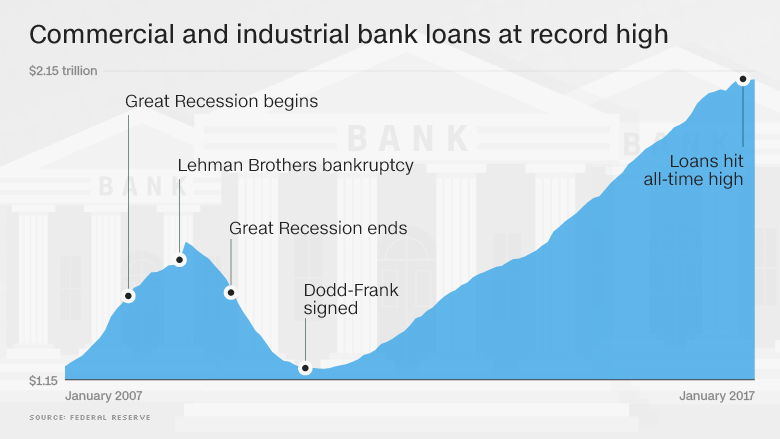 "We have seen healthy growth in actual lending in the economy," Yellen said, noting that bank commercial and industrial lending has exceeded its 2008 peak. Republicans have argued that Dodd-Frank has made U.S. banks less competitive against their global peers. But Yellen said U.S. banks are "quite profitable" and considered "quite strong relative to their counterparts." She credited the fact that American banks quickly built up capital, "as a result of our insistence they do so, following the financial crisis." "I see well-capitalized banks that are regarded as safe, sound and strong," Yellen said, adding this gives them a "competitive advantage." Investors seem to see it that way too. Shares of Goldman Sachs (GS) and JPMorgan Chase (JPM), two of the symbols of American financial might, were on track to close at all-time highs on Tuesday. Goldman hasn't closed at an all-time high since 2007. The White House has said that Dodd-Frank failed to address the Too Big To Fail problem exposed by the 2008 meltdown. But Yellen believes the system is in fact safer and more resilient than a decade ago. She cited the banks' doubling of high-quality capital known as Tier 1 capital. "I believe the financial system is much more resilient than it was," she said. Senator Elizabeth Warren said that Yellen's responses to questions about financial regulation show that Trump and White House officials are "wrong about every major reason they've given to tear up Dodd-Frank." Warren argued that Trump and his top economic official Gary Cohn, a former president at Goldman Sachs, want to return to the kind of lax regulation that led to the 2008 meltdown. "We cannot afford to go down this road again," she said. During the campaign, Trump criticized Yellen, saying she should be "ashamed of herself." While Trump now has three vacancies to fill at the Federal Reserve, Yellen doesn't plan to step down before her term expires in February 2018. To be sure, Yellen didn't argue that Dodd-Frank is perfect as is. Like others, the Fed chief emphasized the importance of cutting the legal and compliance costs that Dodd-Frank has placed on community banks. "We're very well aware of the burden they face and are looking for every way we can find to mitigate those burdens," she said. For instance, Yellen suggested Congress should exempt community banks from the Volcker Rule, which restricts banks from making big bets with their own money. Yellen also said she agrees with the principles laid out by Trump's recent executive order on how the U.S. financial system should be regulated. Trump ordered Treasury Secretary Steven Mnuchin to use those broad principles to "consult" with regulators about changes that should be made to existing law. "I look forward to working with the treasury secretary" and other regulators on this review, Yellen said. But based on her comments on Tuesday, Yellen and Trump officials are likely to disagree about precisely what to do next.